I’ve always loved cooking. To me, nothing is more relaxing than making a tomato sauce from scratch at the end of a busy day, or spending a Sunday morning prepping meals for the week ahead. It’s definitely one of the things you have to get into the habit of doing, and there’s nothing wrong with cutting a few corners along the way. 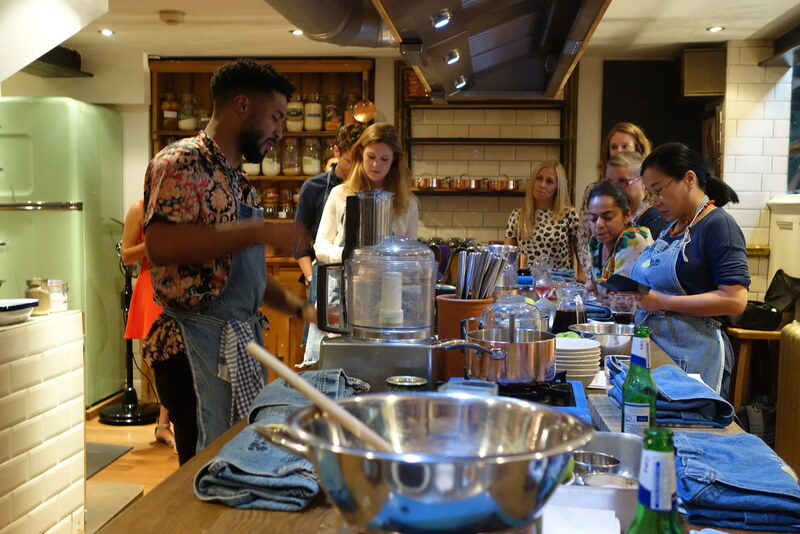 I was really excited to have been invited along to a class by Very Lazy at the Food at 52 Cookery School with Hugo Davies, the man behind the @HugDeCook Instagram account. 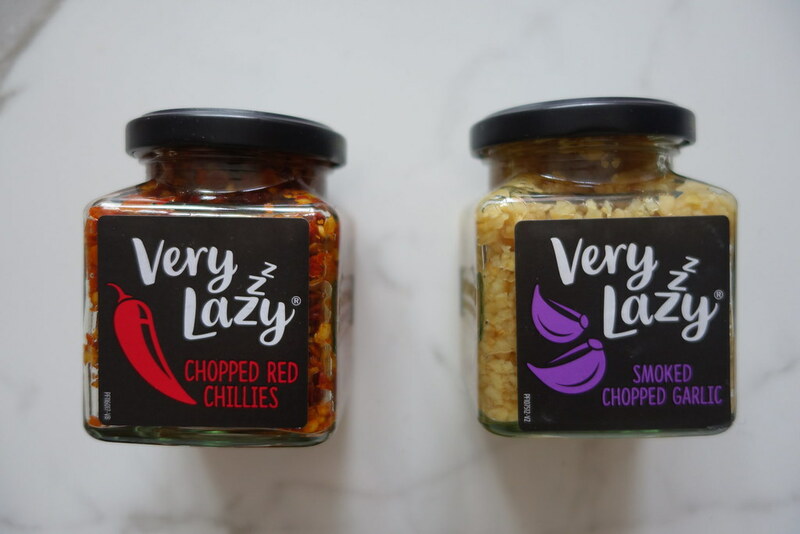 Very Lazy were a staple in my university days, and I was surprised to see how much the range had grown beyond crushed chillies and garlic, but with products made using lemongrass, too. 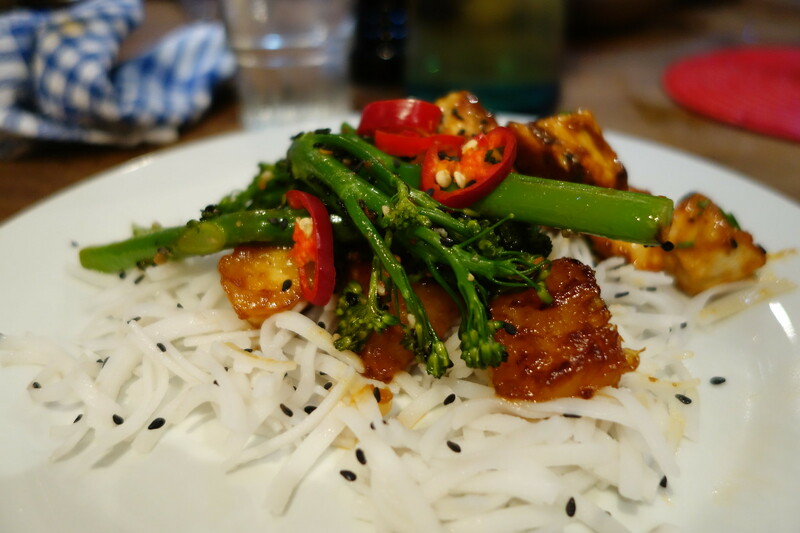 Hugo took us through some absolutely delicious recipes using Very Lazy products – my favourite being the honey and sriracha chicken with grilled pineapple and sesame broccoli. We even incorporated some into the desserts as well, and baked an apple, blackberry and ginger puff pastry with ginger dust and caramel. Hugo’s class got me thinking about the ways in which I could use their products in some of my weekly go-to recipes as well. I was extremely pleased with the end result, and hope you’ll give it a try and tell me what you think! 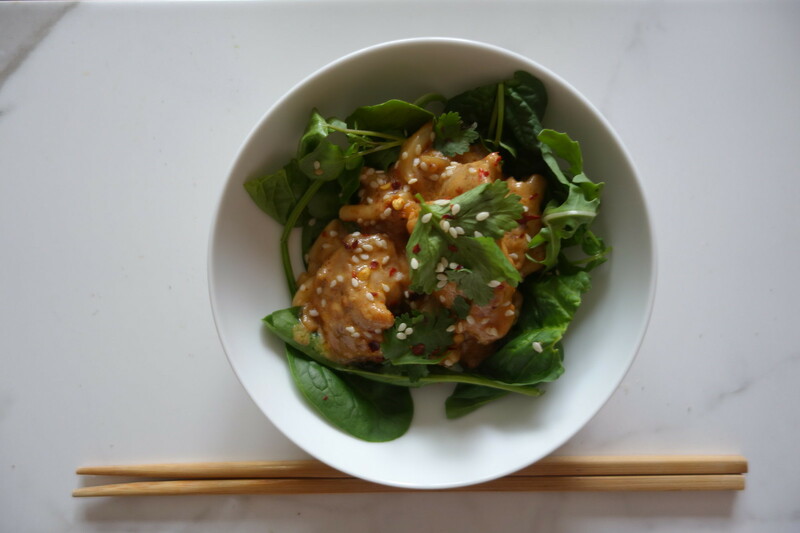 Satay sauce is so easy to make, and making it at home is so much nicer than buying it straight from the jar. You can also adjust the level of spice to suit your tastes, too. In a frying pan, fry the smoked chopped garlic and onion in oil until soft. Add the chicken thighs to the pan, along with the chopped red chillies and some salt and pepper until they are cooked through – set to one side. In a saucepan, add the coconut milk, garlic paste and chilli paste and bring to a simmer. Add the crunchy peanut butter and the soy sauce, stirring constantly. Taste as you go and add more chilli or peanut butter to taste. Go back to the chicken, and heat it through before adding the pre-cooked udon noodles. Stir thoroughly, making sure each noodle is coated in the garlicky-chicken. Once the noodles are heated through, add the satay sauce to the pan, making sure each noodle is coated in the peanut sauce. 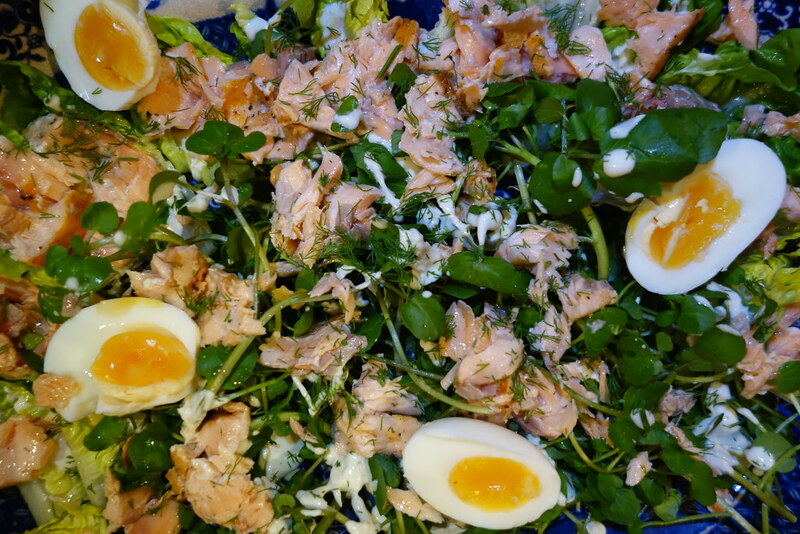 Top with the sesame seeds and coriander – I had it on a bed of salad. 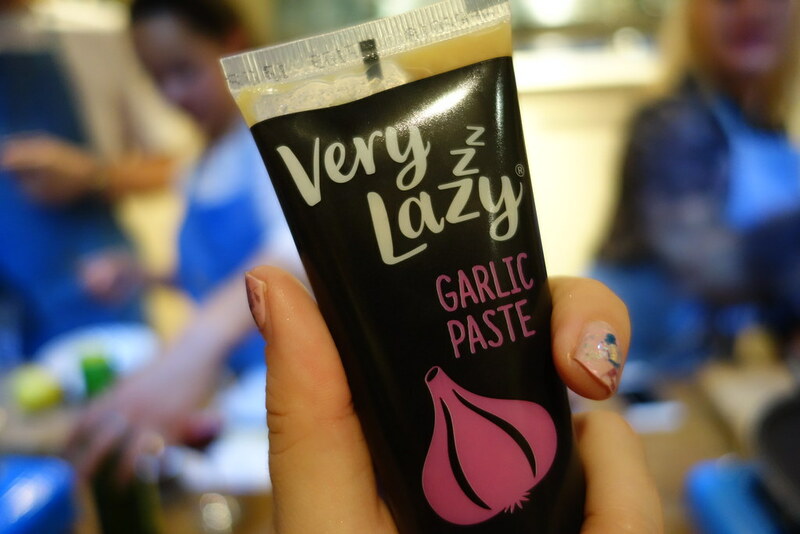 Using the products definitely made the process go a lot speedier – and it all tasted delicious, too! 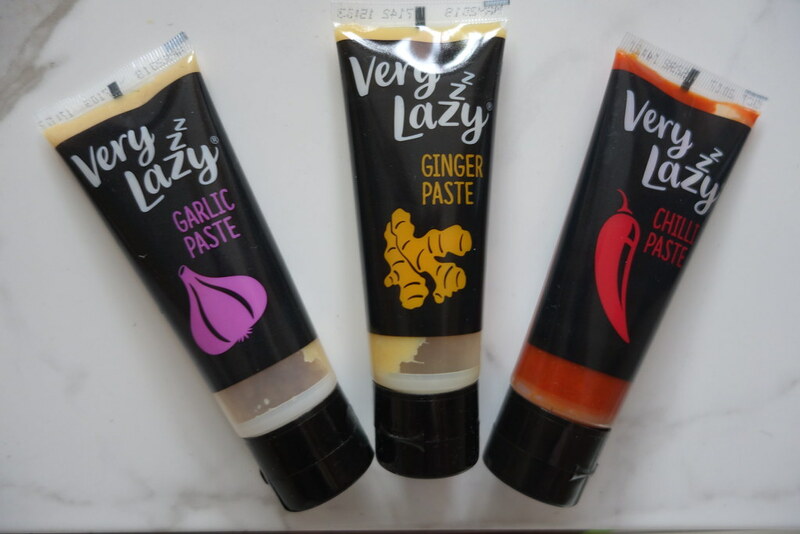 Have you ever used Very Lazy products? Be sure to comment below, or let me know on Twitter, Facebook, or Instagram! 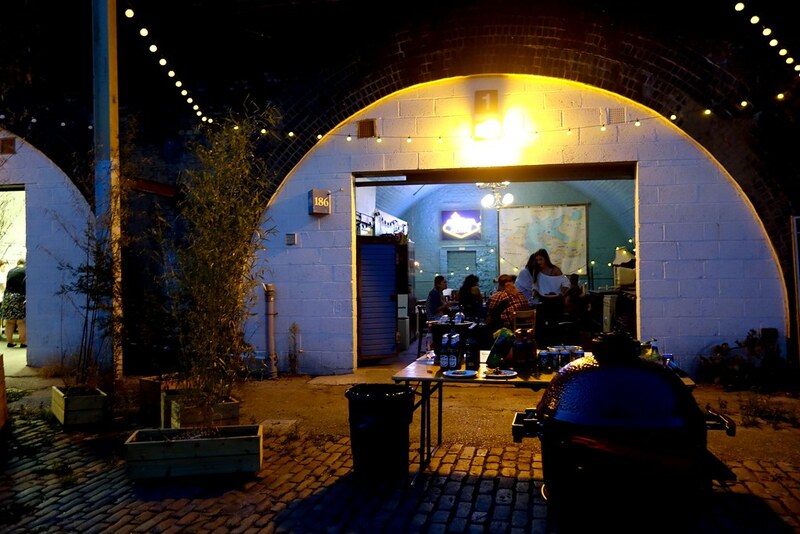 Just tucked away off a little side street near Peckham Rye Station is the London Barbecue School, which specialises in all things B-B-Q. 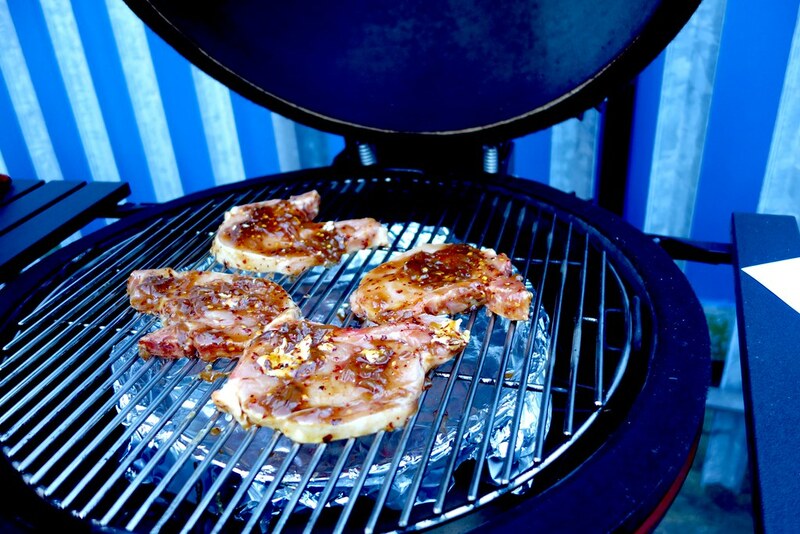 We were to play with the Kamado Joes and experiment with marinades and sauces using the quintessential British picnic accompaniment – Branston Pickle. 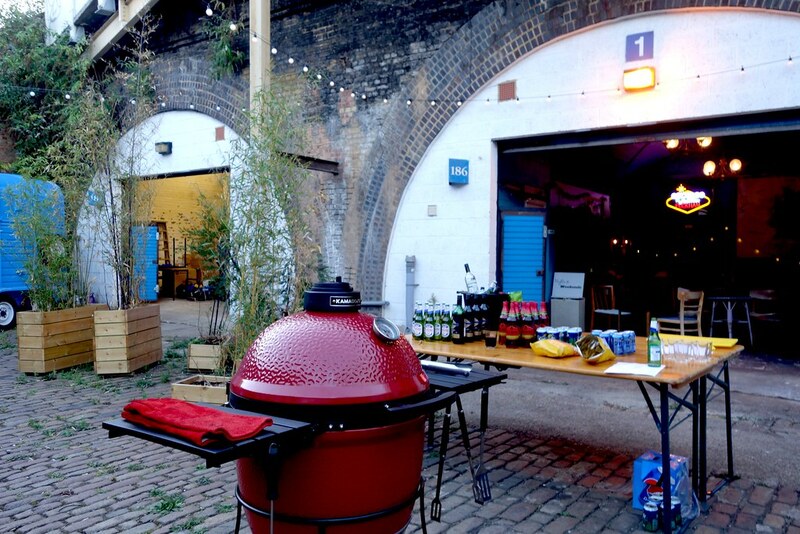 Cooking with the Kamado was completely different to any other kind of barbecue I’ve tried – it was more like an oven, in the way you could control the temperature, but gave all the meat a deliciously smokey flavour. The Branstons team had developed a few recipes using their signature pickle, as well as their range of barbecue sauces. 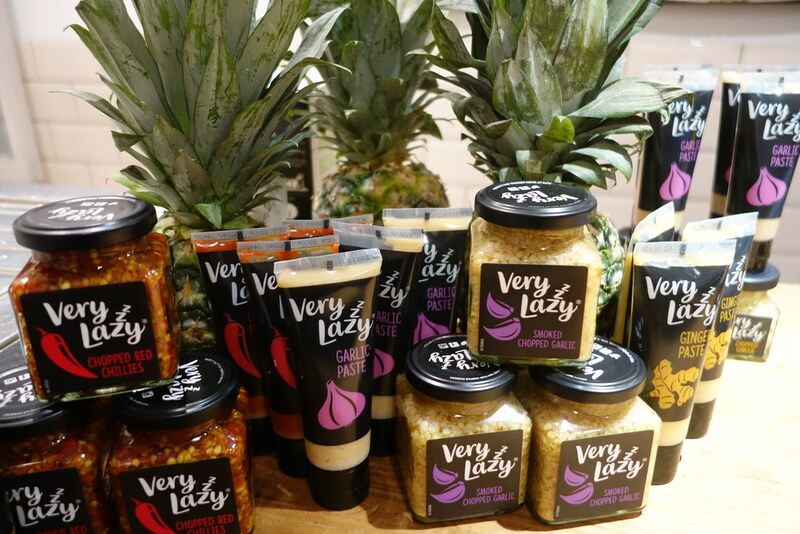 My personal favourites were the marinades made using the pickle – it was really flavourful and went really well as an accompaniment. 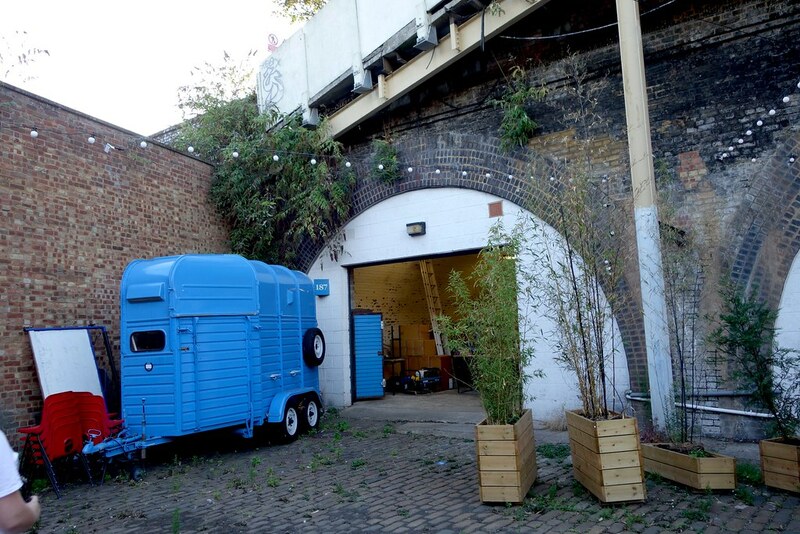 The Tex-Mex Chicken Tacos and sticky pork chops in particular were really lovely. 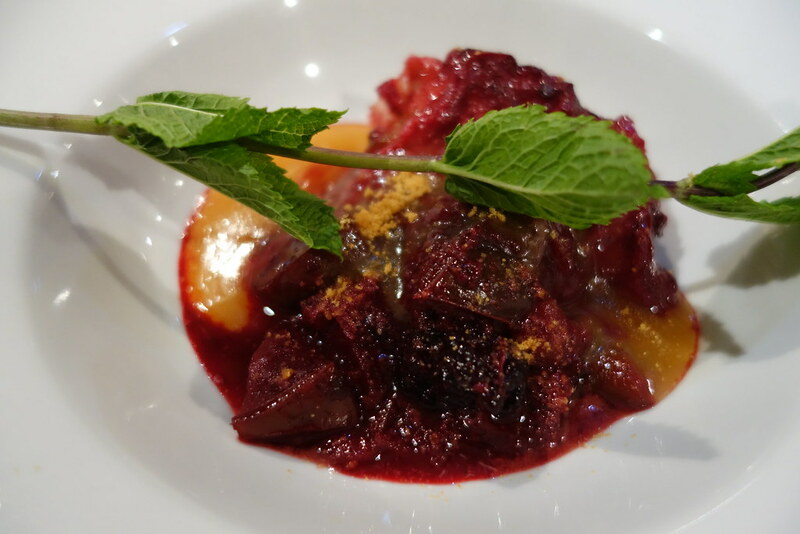 Branston Pickle in marinades – who knew? 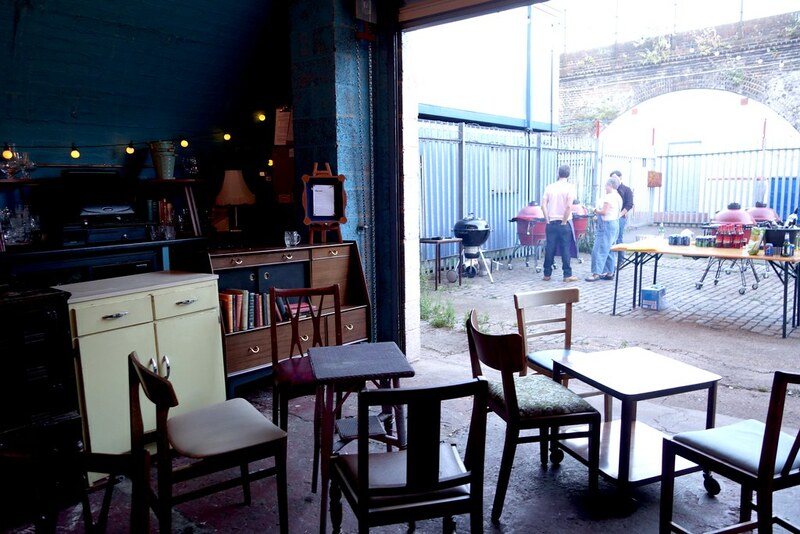 Have you ever been to the London Barbecue School? Be sure to comment below, or let me know on Twitter, Facebook, or Instagram! I absolutely love my apartment. 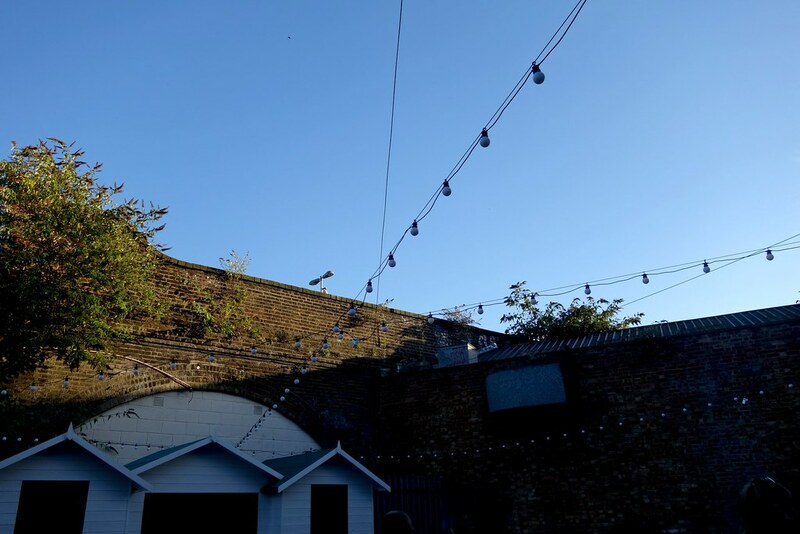 It’s light, with a fantastic view, but it has one major drawback, especially for a food blogger – the kitchen is absolutely tiny. When I heard what the Cuisine Companion could do, though, I was really intrigued. Just check out the control panel! To put it simply, the Cuisine Companion is a food processor that also cooks. But not only can it cook, but you can use it as a slow cooker, a steamer, and to make sauces, desserts, and pastries, too. The possibilities are absolutely endless. The same machine can make beef stock, choux pastry, risotto, creme brulee, and even ice cream. It’s about the size of a stand mixer, and given how versatile it is, I definitely think it’s fully worth all of the counter space it takes up. 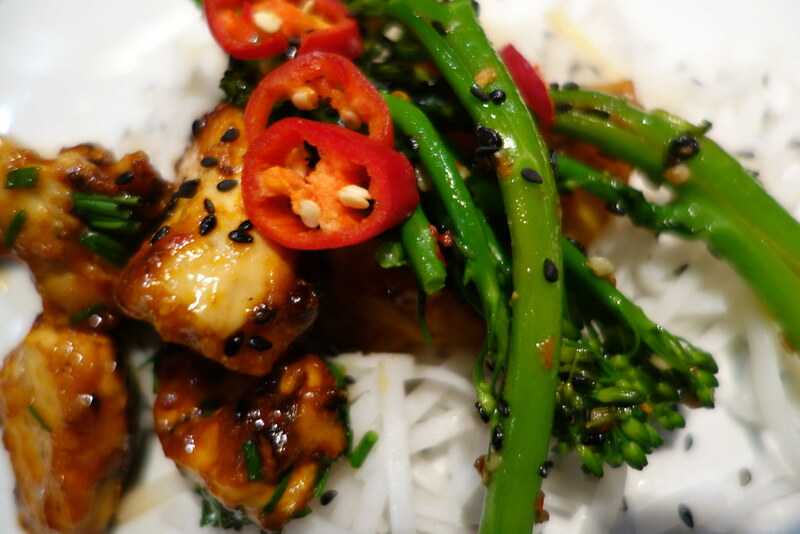 I pretty much haven’t stopped raving about the Cuisine Companion since I’ve had it – I think it is absolutely amazing. I’ve made so many different things with the Cuisine Companion, but so far my favourite use for it has been for soup. 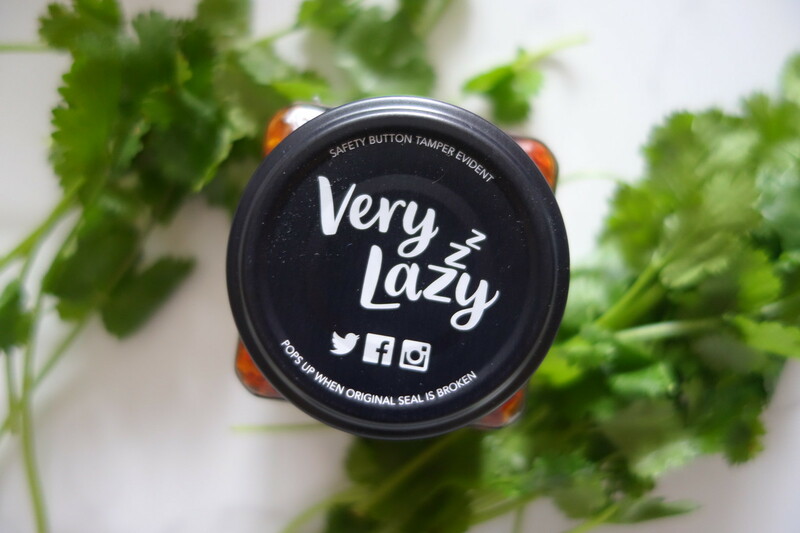 It really couldn’t be easier – barely any washing up, chopping or fuss! My favourite soup has been a carrot and orange one that I had when I was on a business trip to Portugal recently. I decided to take a stab at recreating it with the Cuisine Companion – and it is really delicious, a perfect spring soup recipe. A lovely warming yet refreshing soup for springtime - perfect to make in your Cuisine Companion! Place the ultrablade in the Cuisine Companion. To the bowl, add butter or olive oil, followed by a peeled onion. Chop the onion using the P12 setting for ten seconds. Select the slow cook option, and cook the onions for two minutes. While the onions are cooking, prepare the chicken stock and roughly chop the carrots. Using a potato peeler, peel the zest from both oranges. Once the onions have cooked, add the orange peels, carrots, stock, salt and pepper. Select the 'soup' option for 45 minutes. Once the soup has cooked, the Cuisine Companion will blend the mixture for you! Slice the two oranges in half, and squeeze the juice from both into the soup. Stir the juice through, and serve with warm bread and lots of butter! My favourite thing about the Cuisine Companion is that once the soup is done, I can adjust the heat settings so the soup keeps at a constant temperature. This is perfect for me, as I like eating quite early, but my boyfriend tends to work late – this way, we both get to enjoy a hot meal! 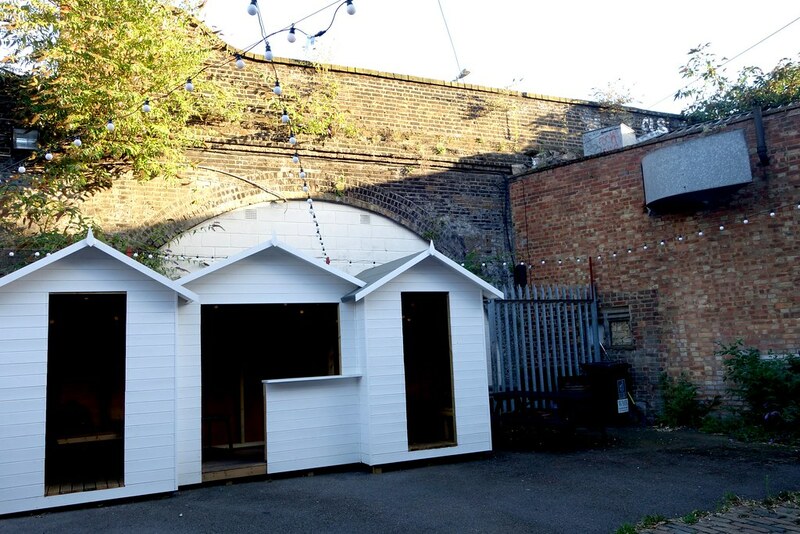 It’s also been fantastic for big gatherings, and entertaining, too. Making a chicken liver pate from scratch can be fiddly and time consuming, but the Cuisine Companion makes it almost effortless. 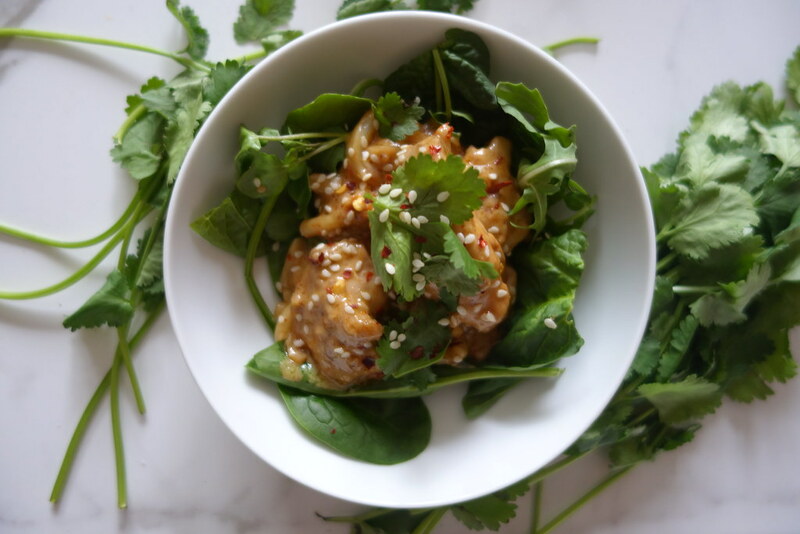 Barely any prep, or messing around with raw chicken liver required – it’s so easy! The Cuisine Companion comes with a big recipe book which is perfect for trying new ideas. 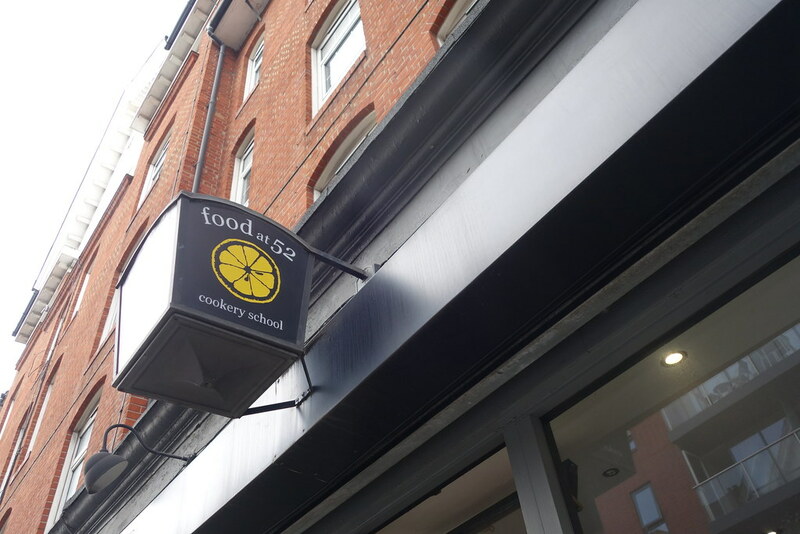 I tried their Chicken Liver Pate with Port recipe – and it was delicious! I REALLY can’t recommend the Cuisine Companion enough – and it’s really changed the way I’m eating for the better. All the soups I’ve tried have been so great, and I’ve definitely been getting more vegetables in thanks to it. At £699.99, it’s definitely not an impulse buy, but it is around £200 cheaper than a Thermomix – and a more attractive looking machine, too! Do you have a kitchen gadget you really can’t live without? Be sure to comment below, or let me know on Twitter, Facebook, or Instagram! 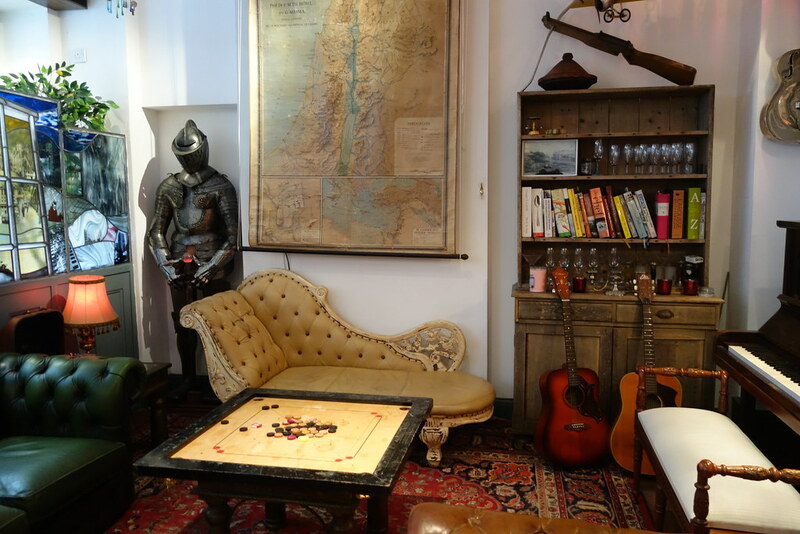 *I was gifted a Cuisine Companion for the purposes of review – as always, views are my own! After my trip to Wales last weekend, I’ve been itching to go away. I was also away in Lisbon for work this week, but didn’t get any time to go exploring, and it’s got me thinking about my next holiday! After my month off over Christmas, I’ve been on a bit of a budget, which means I’ll probably be spending my break somewhere in Europe. The team at the Bolsover Cruise Club invited me to submit an entry for their #MeddySteadyCook competition, inspired by the flavours of the Mediterranean. 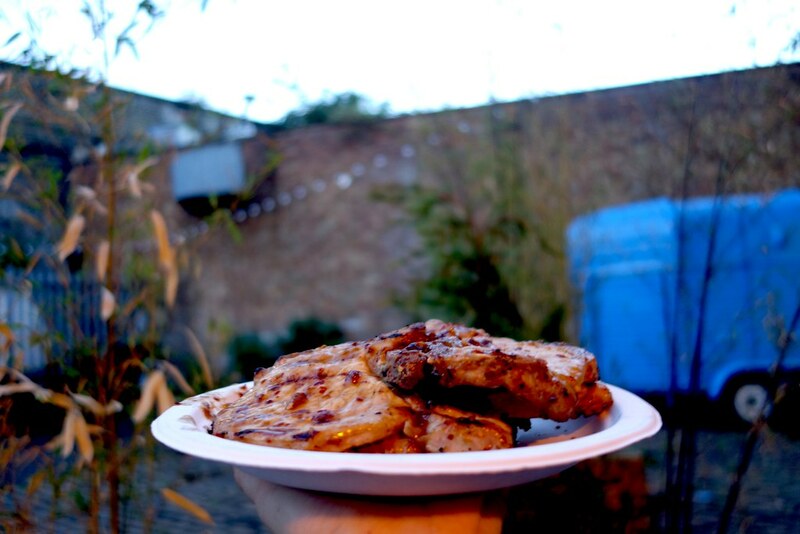 I adapted my go-to barbecue sidedish recipe to include some Cypriot halloumi I was recently gifted, and it is good. This halloumi, lentil and chorizo salad is incredibly simple to make, but is delicious and pretty fail-proof, too! It’s perfect for BBQs, or as a side dish for grilled fish or chicken. This Halloumi, Lentil & Chorizo salad is so simple to make, but so delicious! The perfect accompaniment to fish, grilled chicken, and great for BBQs too. Boil the lentils in water for 25 minutes, until tender. Drain the lentils, and add the chopped onion, olives and tomatoes to the dish. In a frying pan, fry the halloumi until crispy, and using the same pan fry slices of chorizo. Season with olive oil, lemon juice, salt and pepper and garnish with rocket to serve. I haven’t quite decided where I’m off to just yet, but I’m thinking somewhere warm! 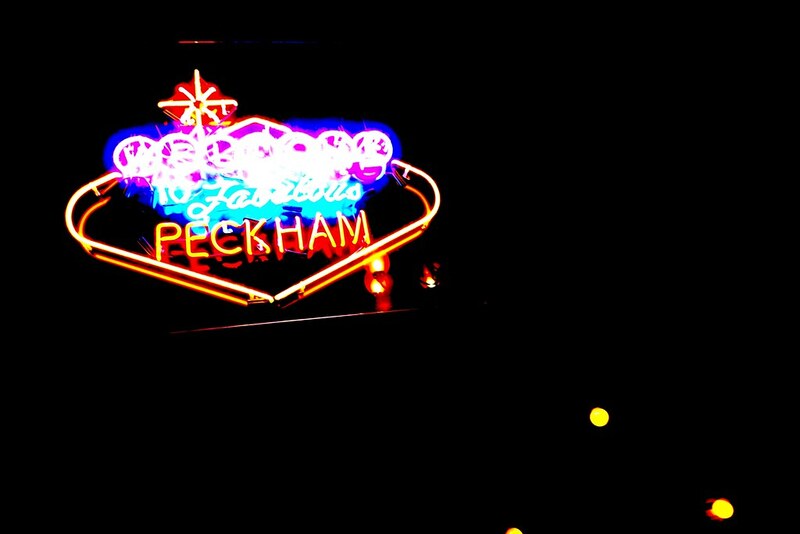 Have you booked your summer getaway yet? Be sure to comment below, or let me know on Twitter, Facebook, or Instagram! I was invited to participate in the #MeddySteadyCook competition, but all views are my solely my own. I’ve been going out to a lot of Mexican restaurants recently – which means I’ve been having a lot of guacamole. 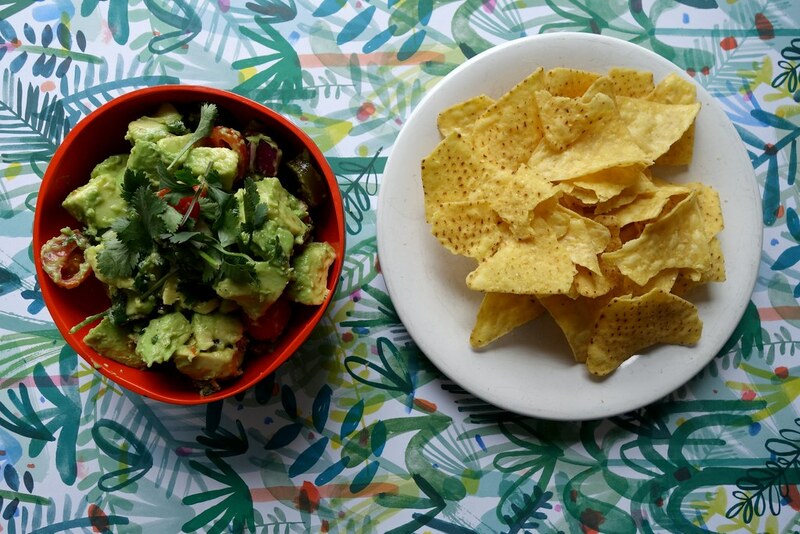 London is absolutely fantastic for food, but really amazing guacamole is something that I struggle to get here – I much prefer chunky guacamole over pureed, flavourless mush. 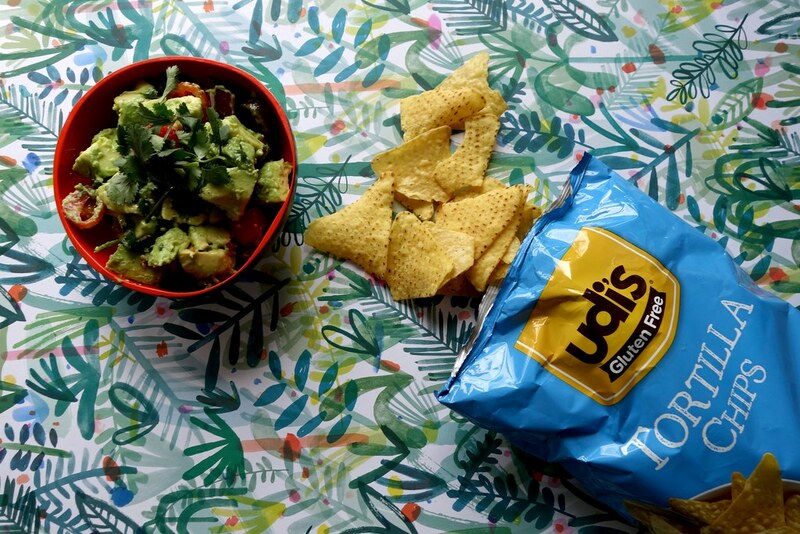 So when Udi’s send me over a hamper of some delicious gluten free goodies, my eyes went straight to the pack of tortilla chips – and I couldn’t think of a better way to enjoy them than with a delicious emerald bowl of the most incredible guacamole. This guacamole should probably come with a warning, as it’s utterly addictive – I usually eat the lot in one sitting. 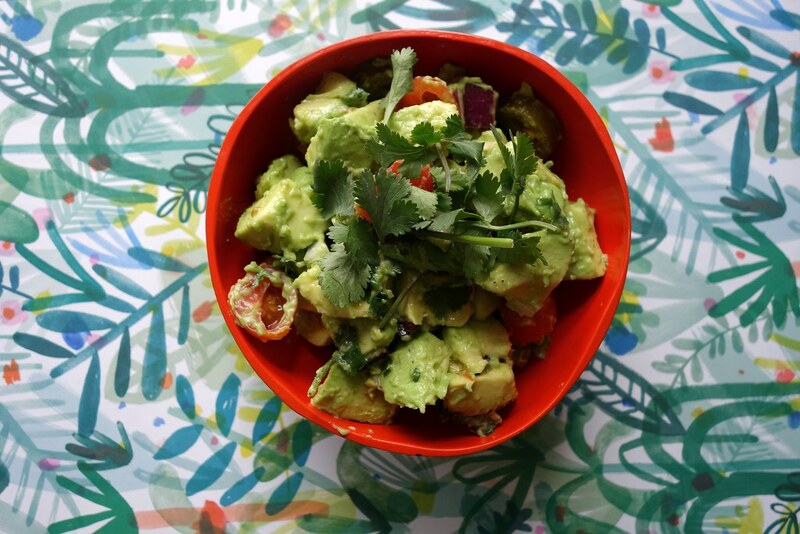 This guacamole recipe is seriously addictive - you have been warned. Slice the cherry tomatoes in half, squeeze out excess juice and discard seeds. Slice avocado in half, and remove seed. Slice the avocado flesh lengthwise, in a grid pattern. 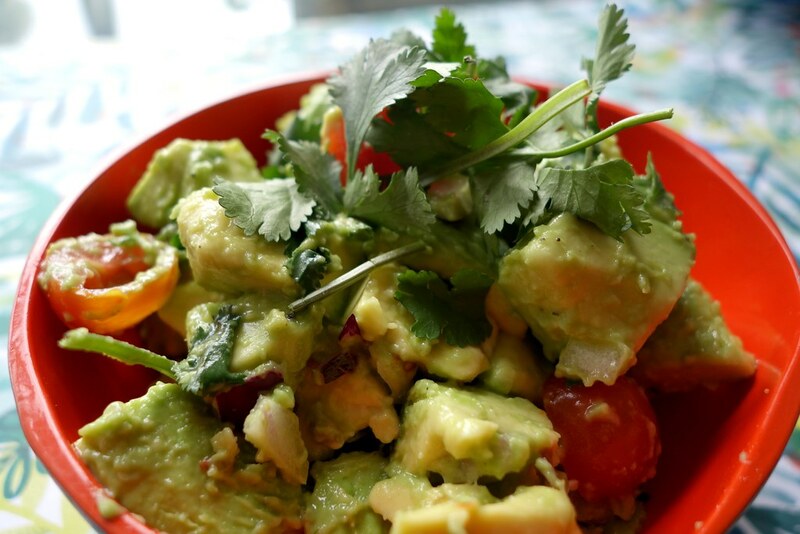 Scoop the avocado flesh out with a spoon, and add to the onions and tomatoes. 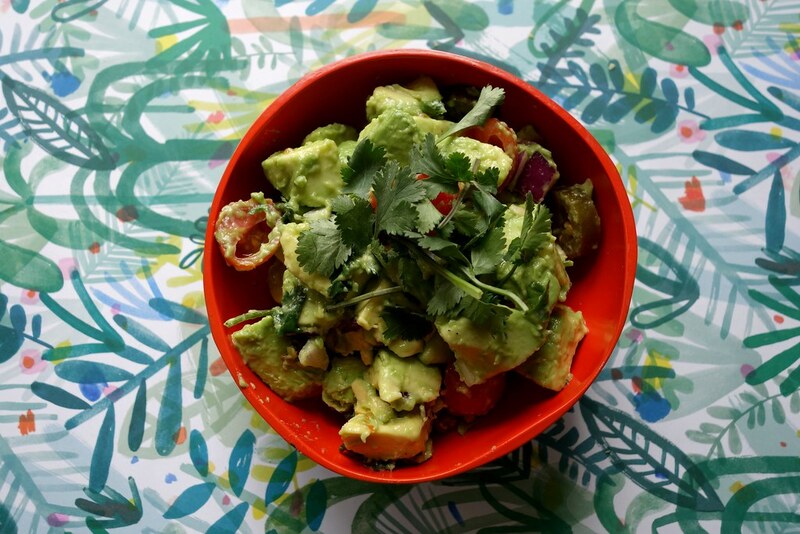 Try not to mash the avocado, but fold all the ingredients gently - you want to retain a chunky texture. Season with salt, pepper, and lemon juice, and garnish with coriander to serve. It’s such a simple thing to make, but so delicious. It’s always the perfect dish to take to parties – a sure hit! 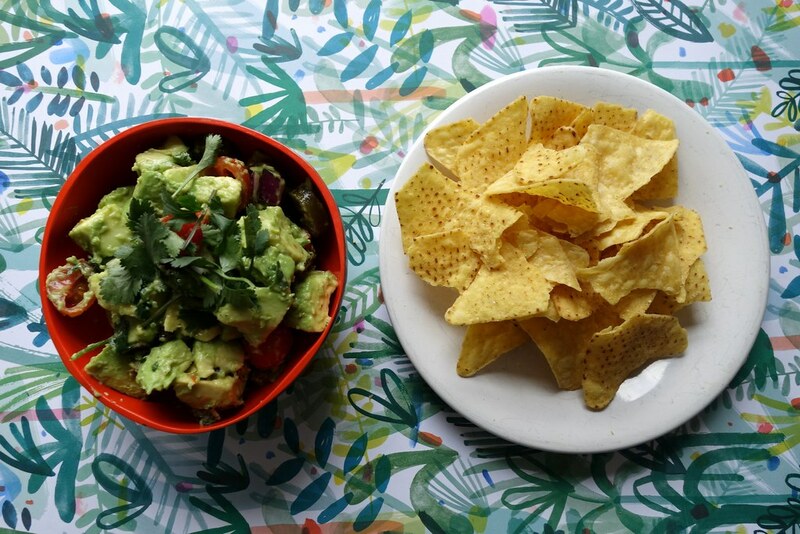 What’s your favourite way to eat Guacamole? Be sure to comment below, or let me know on Twitter, Facebook, or Instagram! 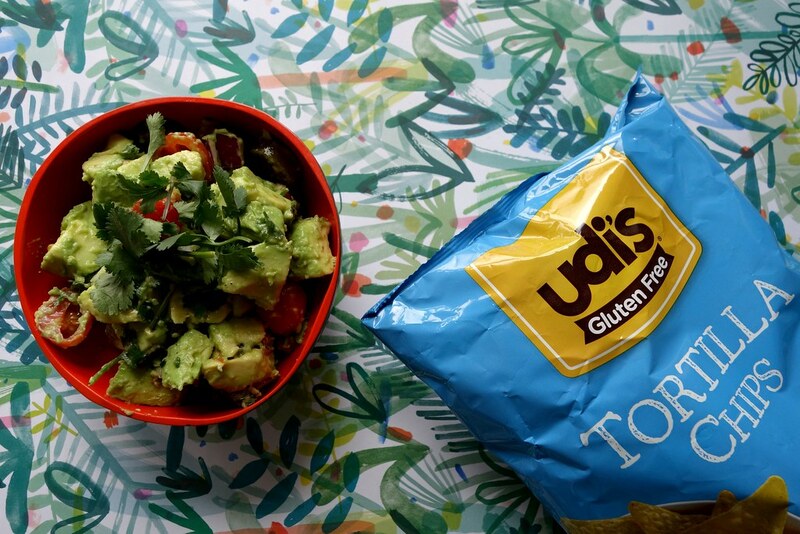 I received a hamper from Udi’s Gluten Free for the purposes of review – if I didn’t like it, I wouldn’t blog about it!